Q. I’ve got a monster presentation file that needs to be re-arranged into a different order. What’s the best way to attack this? A. One way to make the job easier is to create sections. Given the situation you describe, I’d work in Slide Sorter view, where you can see all of your slides in thumbnail format on the screen. Beginning with the first slide, add a section (Right-click or Ribbon button). 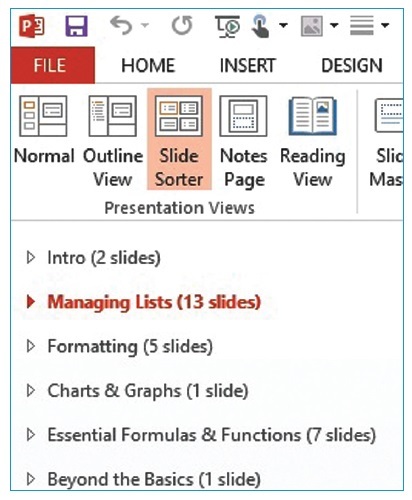 Create additional sections at logical places to group slides that belong to a single topic. When you’re done, right-click on any section and choose Collapse All. Now, you can drag a section and all its slides to another place in the presentation. Q. I’ve inherited a presentation that has a lot of transitions. Is there any way to get rid of them all at once? A. There sure is. On the Transitions tab, choose None in the Transitions gallery. You might also want to make sure that the checkbox for On Mouse Click is also checked. Then on the right in the Timing group, click Apply to All. All of your slides should now only advance on a mouse click or keystroke and show no effects as one leaves the screen and another appears. Q. I used to see a Notes pane at the bottom of the screen. It’s gone. How do I get it back? A. First, rest assured that if you put any notes in before you noticed this panel missing, they are still there. As with other Microsoft Office applications, if there’s something missing from view, click on the View tab. In the Show group, look for the Notes button, and click it. Now, look at the bottom of the screen, your notes should be back. Unclick the button to re-hide Notes and have more screen real estate to work with. 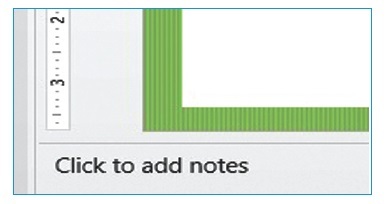 If you want to print a speaker’s copy of your notes, on the View tab, choose Notes Page. You’ll see your notes below each slide, so you can stay on track in front of the room.